Lifeguard Ben Carlson, 32, jumped into the water from a rescue boat that had responded to save the swimmer who was struggling in 6- to 8-foot waves off the Balboa Peninsula. Both men were hit by a large wave in the midst of the rescue attempt. On Sunday about 5,000 people watched from the Newport Beach Pier and shore as about 2,500 people took to boats and boards and made their way out past the breakers. 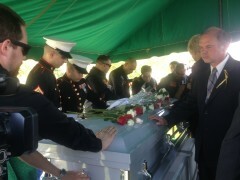 Mourners threw flowers into the water, and those on shore and in the water observed a moment of silence for Carlson. 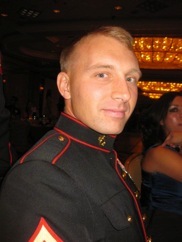 Jesse Wilkes, Marines, served 2 tours in Iraq, killed on a motorcycle accident.